Who could we be? That's the mystery! Go ahead and take a guess and then go enjoy your day. Check back tomorrow and I'll reveal the answer. The first correct post will be declared the winner. Louisa Alcott and her two sisters. Merideth, good guess, but these are not "Little Women." 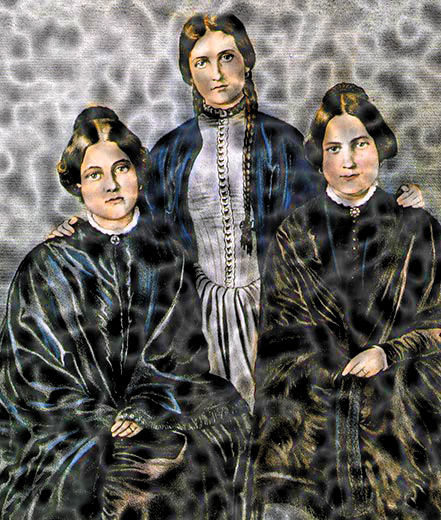 Anon, thanks for the guess, but it is not the Bronte sisters either. They had lots of dead friends. Awesome! Way to go DAG! I was just about ready to give a knock knock joke as a hint. once again, I'm too slow! once again, I went to the 'net and read up on the Persons of Mystery. Thanks!